Is That Skin Cancer, or Just a Bug? What's a summer day without a cool and refreshing drink? Answer: a travesty. But what if there was another way to consume alcohol? Well, the future is here. You can now eat, slurp, and lick your booze. 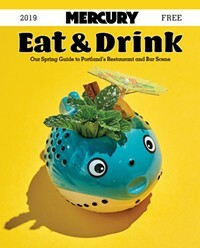 I present to you my favorite alternative ways to get drunk in Portland this summer. These boozy popsicles are legit. They are made in Portland with almost all seasonal local produce and ingredients. At 6.5 percent alcohol, these pops are refreshing, delish, and a downing a few of them might actually get you tipsy. Some of my favorite summer flavors are the Hurricane Pop (featuring house made passion fruit purée, fresh lime and orange juice, pomegranate grenadine and Bull Run Single Malt Whisky), the Raspberry Mint Julep (made with Veridian Farms raspberries, fresh mint, a hint of lime, and lots of bourbon), and the classic Strawberry Margarita (made with Oregon strawberries, a pinch of salt, tequila, and orange liqueur). The only downside is that they’re not yet available in grocery stores, but they can be ordered on their website (sloshypops.com) and you can rent a cart for a party. Their PopCycle makes regular appearances at local public events, so check out their Facebook for deets! I came across my first tequila-soaked watermelon slices at a UO tailgate a few years back. Some kind stranger filled a Ziploc bag with tequila and cut up watermelon, and offered me some. Needless to say, this person was a genius and a life-changer. This can be done with literally any liquor and fruit combination, but the more porous the fruit, the better. Strawberries, watermelon, peaches are some of my faves. For best results, soak the fruit overnight, or at least for a few hours before consuming. An added bonus: once the fruit is all gone, you have fruity booze!